I1a Hardins Short Name: Can we for convenience call this family something more memorable like "The Viking Hardins"? ...because they are of Norse ethnicity. "Norse Hardins" is good. Or "Hatter Hardins" since the Pendleton District, South Carolina Hardins produced a number of hatters. Any better ideas, fellow researchers? 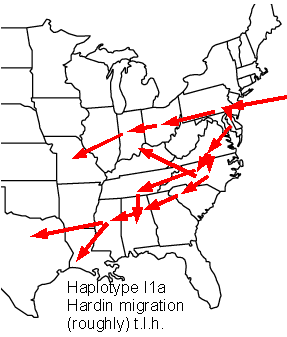 The most reliable place to start research is with the earliest known ancestors of Hardin men who have had a Y-DNA test. See those records at William Clark Hardin's HHHDNA.com. Bill also has a Hardin Source Document Repository linked from the above page. Other sites displaying Hardin Y-DNA are Family Tree DNA Hardin Project where you can order a test - The 37 and 67 marker tests are most useful - and here's FTDNA's Public Hardin Page. Examining hhhdna.com, you notice first that the surname is used by many entirely unrelated families. The Viking Hardins are unrelated to Revolutionary Col. Joseph Hardin and influential Tennessean, The French Hugenot Hardoins, the frontier Indian-fighting Hardins in Kentucky or Ohio or Texas, nor ex-president Harding, nor to the psychopathic multiple killer John Wesley Hardin. There are killers in our family, yes, but they killed their wives and others out of the public eye probably including Indians. They served as enlisted men in all the wars and were killed in them, including the U.S. Revolution and the U.S. Civil War. From present knowledge they were not particularly militaristic. Most were agrarian. They liked to live beside running water. My own Hardin ancestors had a knack for losing possession of their farms. Pendleton                       John Hardin             1806 SC         d Ala.